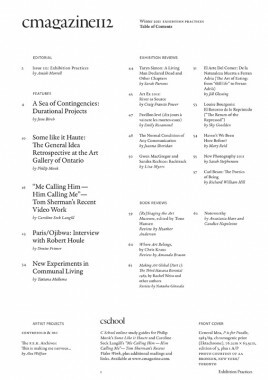 Tatiana Mellema — Textfield, Inc.
Issue 112, Exhibition Practices, include Jesse Birch, A Sea of Contingencies: Durational Projects, on Sabine Bitter and Helmut Weber’s A Sign for the City and Cate Rimmer’s curatorial project, The Voyage, or Three Years at Sea; Philip Monk, Some Like it Haute, on the General Idea Retrospective at the Art Gallery of Ontario; Caroline Seck Langill, Me Calling Him — Him Calling Me, on Tom Sherman’s recent video work; Denise Frimer, Paris/Ojibwa, an interview with Robert Houle; and Tatiana Mellema, New Experiments in Communal Living, looking at projects including the La Commune. 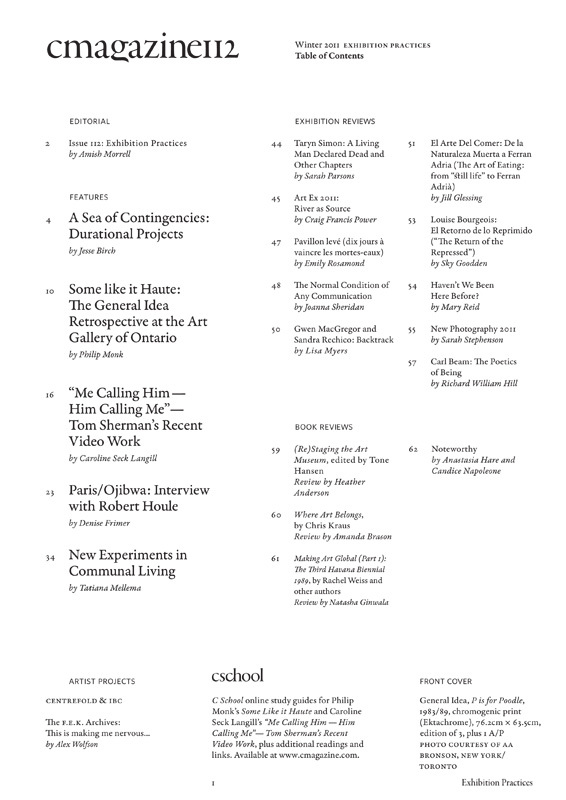 Exhibition reviews include Taryn Simon: A Living Man Declared Dead and Other Chapters, at the Tate Modern; Art Ex 2011, in Grand Falls-Windsor, NFLD; Pavillon levé (dix jours à vaincre les mortes-eaux), at Circa Gallery, Montreal; The Normal Condition of Any Communication, at TPW in Toronto; Gwen MacGregor and Sandra Rechico: Backtrack, at A trans Pavilion, Berlin; The Art of Eating, at CX Catalunya Caixa Obra Social, La Pedrera, Barcelona; Louise Bourgeois: El Retorno de lo Reprimido, Fundación Proa, Buenos Aires; Haven’t We Been Here Before?, at Platform Centre for Photographic + Digital Arts, Winnipeg; New Photography 2011, at the Museum of Modern Art, New York; and Carl Beam: The Poetics of Being, at the National Gallery of Canada, Ottawa. 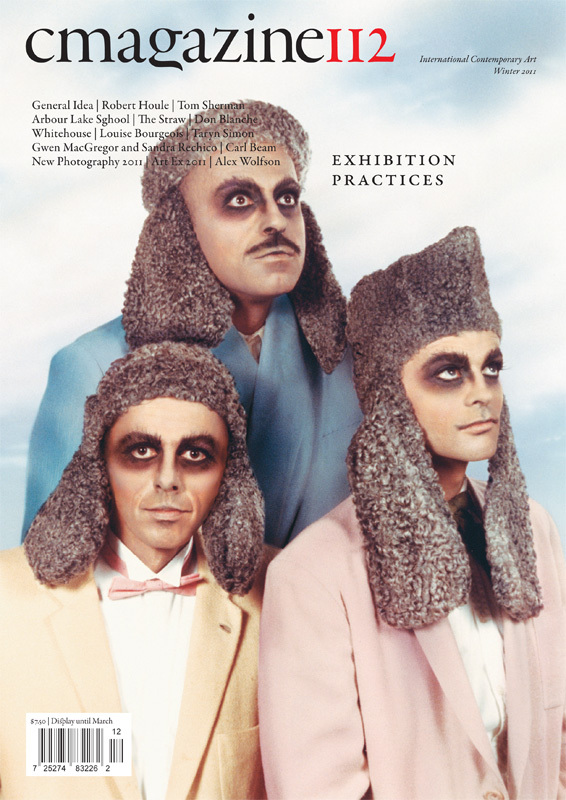 Also included in issue 112 are book reviews and an artist project by Alex Wolfson.